We’re fans of Laughs on Philly and the stand-ups who run it, so we were extremely excited to hear that their brand-new comedy showcase (every last Wednesday of the month at Milkboy) would also feature sketch comedy! This is what some might call, ‘the best news’ or ‘simply awesome’. And why not? Stand-up and sketch comedians working together has resulted in some of the most successful and critically acclaimed television of the past decade (i.e. Dave Chappelle, Amy Schumer, Demitri Martin). It also comes as no surprise that these two forms of comedy pair well together in live performance settings. When done well, both stand-up and sketch work with uniquely personal comedic material that has been crafted, rewritten and honed over time in effort to relate to (and in turn, connect with) their audiences. 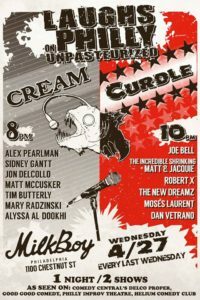 The inaugural Laughs on Philly at Milkboy features a split show with intermission, with ‘Cream’ at 8:00pm and ‘Curdle’ at 10:00pm. Sketch comedy will be featured during ‘Curdle’ with performances from both The Incredible Shrinking Matt & Jacquie and The New Dreamz. But you’d be a complete fool to miss the entire show starting at 8:00pm with stand-up by Alex Pearlman, Sidney Gantt, Jon Delcollo, Matt McCusker, Tim Butterly, Mary Radzinski, Alyssa Al Dookhi, Joe Bell, Robert X, Moses Laurent, & Dan Vetrano. After a one-year hiatus, The Theme Show returns to the Philly Improv Theater (PHIT) with the goal of hosting a diverse breadth of comedians on a single bill who develop and perform an original piece of comedy built from a single ‘theme’. The Theme Show provides opportunities for comedians to develop new material, showcase existing pieces that fit the theme, and the ability to introduce themselves and their audiences to other comedians and their audiences. Community – Networking – Theme Show. Appropriately titled for its return to PHIT’s schedule, this month’s theme is ‘Rebirth’. As far as what that will inspire sketch comedians to write & perform, you’ll simply have to attend the show to find out. The Theme Show is hosted by sketch group, Wretched Hive and includes performances from Julia Celley (Locked in Julia’s Basement), Kathryn & Sarah, Sweetish, Baby Steps, Joe Bell, and Secret Pants.